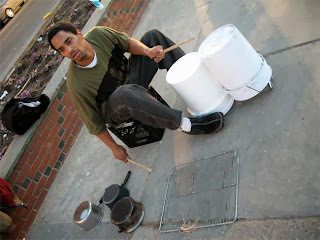 Boston Bucket Drumming At its Finest. Jermaine Carter HD Youtube!!! Jermaine Carter has played buckets in Boston, Ma ever since I can remember. He has also played in Baltimore, Philly, New York. His sound of tribal rhythms which resonate through Downtown Crossing, he is a 26-year-old from Dorchester with a face like Sammy Davis Jr. He is the man.